Andrew Warren Stephens of Sebring, Florida died November 10, 2018. He is survived by his parents; Rebekah Gray Wills and Marion Edwin “Win” Stephens V and his older brother; Jacob Edwin Stephens of Sebring, grandparents; Bishop Richard and Eileen Wills of Lakeland and M. E. “Steve” IV and Mollie Stephens of Sebring; and many loving aunts, uncles, cousins and extended family. Andrew was born on July 28, 2004 in Winter Haven, Florida to Rebekah and Win Stephens. 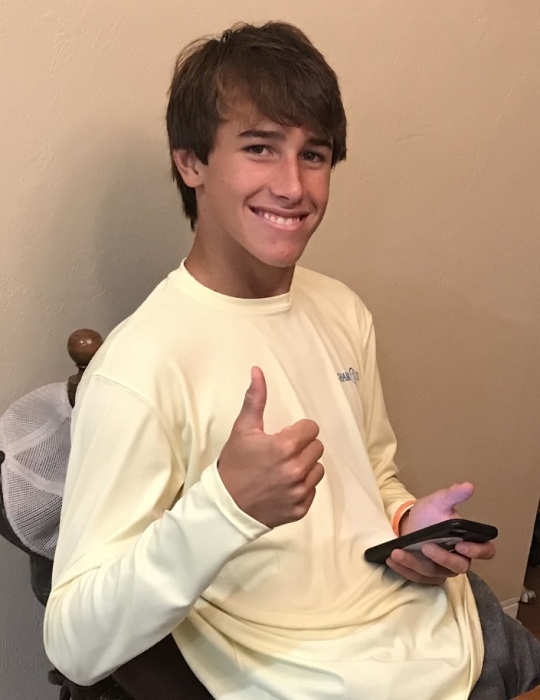 He was a freshman at Sebring High School and enjoyed fishing, hunting, and time spent with his many friends and family members. Andrew was a member of the Highlands County Anglers Bass Fishing Team. He was an active FFA member through the Sebring Middle (6th - 8th grades) and Sebring Senior (9th grade) Chapters. He was a member of the Lorida Livestock 4-H Club (3rd – 9th grade). Andrew showed beef cattle starting at the age of five until current. He won Reserve Grand Champion Commercial Heifer and Reserve Grand Champion Junior Showmanship Commercial Heifer in 2016. The Market Steer project Andrew was preparing for this year’s fair will be shown and marketed by his friends. The proceeds will go to the Andrew Stephens Memorial Fund established by Heartland National Bank, Sebring. Andrew was a skilled hunter, shooting his first large buck on his first deer hunt when he was seven years old. He also enjoyed every second of being on the water fishing, swimming, and just hanging out with friends. Andrew was most passionate about fishing, saltwater and fresh. He caught many fish at his great-grandparent’s island house. He also loved to fish off shore and the flats with his family. Andrew loved being with his friends. His all-time favorite activity was socializing! A Life Celebration is scheduled for Sunday, November 18, 2018 at 2:00pm at the Highlands News-Sun Center, 781 Magnolia Avenue, Sebring, Florida 33870. Pastor, Kendal Sheen will officiate the ceremony. All are welcome to attend and celebrate Andrew’s life. In lieu of flowers, donations may be sent to the Andrew Stephens Memorial Fund at Heartland National Bank, 320 US Hwy 27 North, Sebring, Florida 33870.